The yield might sound like a lot, but remember, these cookies are very, very thin. In the microwave or in a small saucepan over low flame, heat the honey until very warm and runny. Pour into a bowl along with the almonds, flour, zest, and black pepper to taste. Mix, using your hands or a wooden spoon, until dough forms. It will be very dense and crumbly. Don’t worry; it’ll come together while it bakes. Put a little flour in a small bowl or on your work surface and coat your hands with it. Put 1/4 of the dough onto the prepared baking sheet and press into a fairly flat (about 3/4-inch high) rectangle, roughly 1 1/2 inches wide and 6 inches long. Repeat, creating a total of 4 rectangles. Bake in a preheated oven for 10 minutes. Remove the baking pan from the oven, turn the rectangles over, and bake for 15 minutes, until golden and set. Remove the pan from the oven and while still hot, cut each rectangle into very thin slices, about 1/4 inch thick. 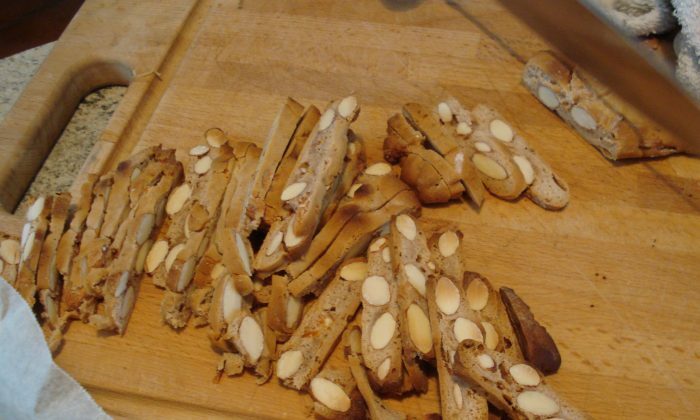 Once the biscotti are cool, they can be stored in a sealed container for several months. Reprinted with permission from “Dolci: Italy’s Sweets” by Francine Segan (Stewart, Tabori & Chang). Photography by Ellen Silverman.